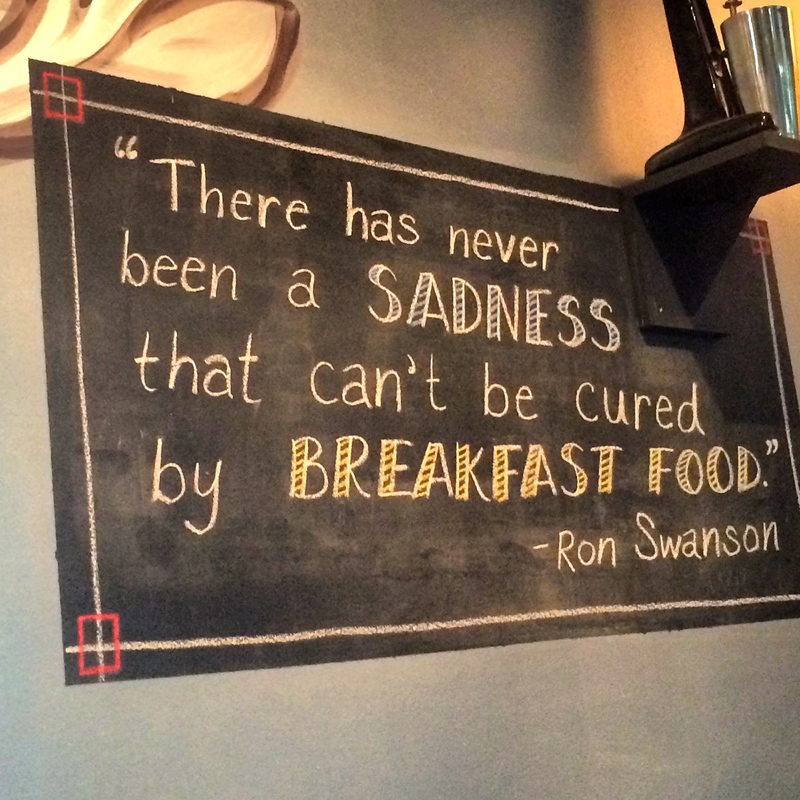 “We serve breakfast all day.” These are the magic words that get me every time I walk into a restaurant, so I knew I was in the right place when I read those words on the Dimestore menu. Tucked inside the Chrysler House office building in Detroit, Dimestore is a cozy little spot, with funky wall decor, an open kitchen and bar, and great street views through the large windows. While you’re likely to wait at Dimestore, or in my case, wait more than anticipated, know that the waitstaff are no strangers to customer service. Since the kitchen was backed up during my visit, my waitress brought out a complimentary croissant that I devoured before the food arrived. 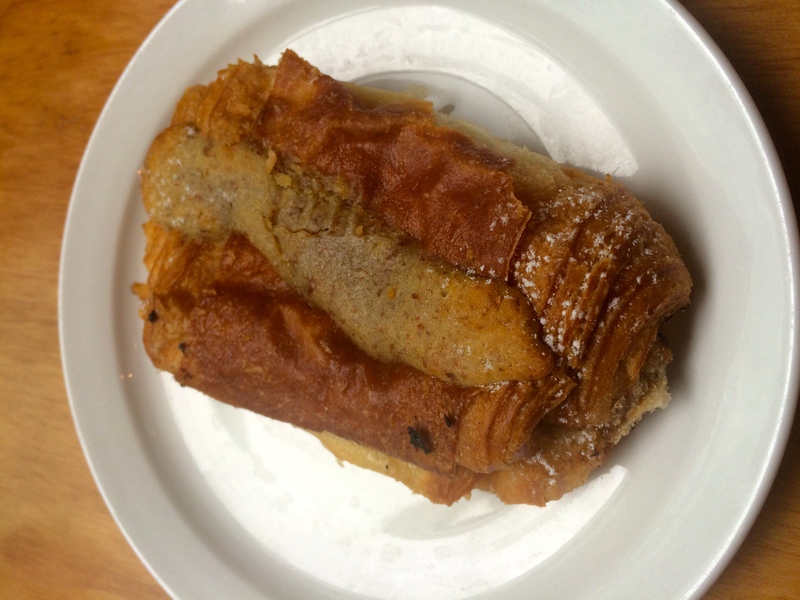 The warm, flaky, almond and chocolate croissant tasted like it came straight off of the streets of Paris. about ordering breakfast food at 2:00 in the afternoon, because I knew my taste buds were going to get pampered. I eagerly selected the “Duck Bop Hash,” which is a unique twist on a potato hash, complete with tender duck confit, spinach, onion, topped with two over-easy eggs, and drizzled with a Korean bbq glaze. Although one of my eggs was slightly overdone, the other yolk was soft and runny, just the way I like it. The dish was a beautiful medley of crunchy, soft, savory, and spicy. I dug right in and pretty much devoured it all! Dimestore has plenty of options for you. 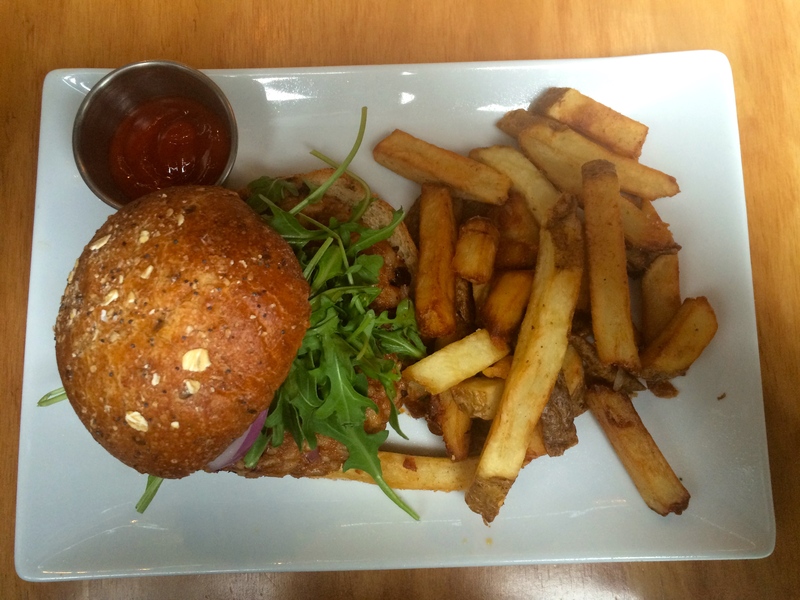 My dining partner chose the veggie burger, which was housemade, hearty patty, topped with creamy goat cheese and honey mustard, served with a side of thick-cut french fries. This was no “Boca Burger,” mind you. And if you’re looking for a meaty option, try the duck reuben or the maple and mustard glazed salmon salad. This menu is anything but ordinary, and there is something for everyone — drinks included. Whether you’re in the mood for alcohol or just a hot cup of coffee, Dimestore has it all. 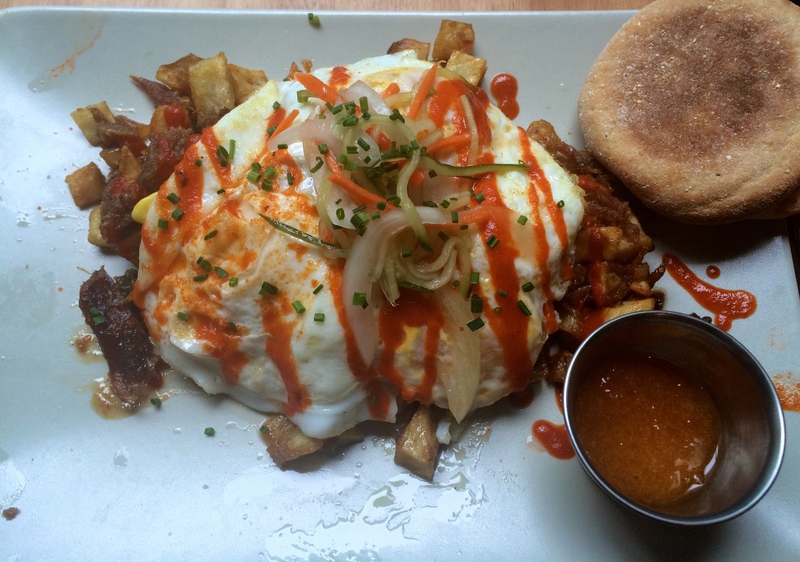 Their Bloody Mary is top-of-the-line, and they serve good ol’ Zingerman’s coffee. If you’re looking for a brunch spot that is somewhere in between diner joint and swanky country club-style, Dimestore is that happy medium. They create food with style, and serve it up with class. 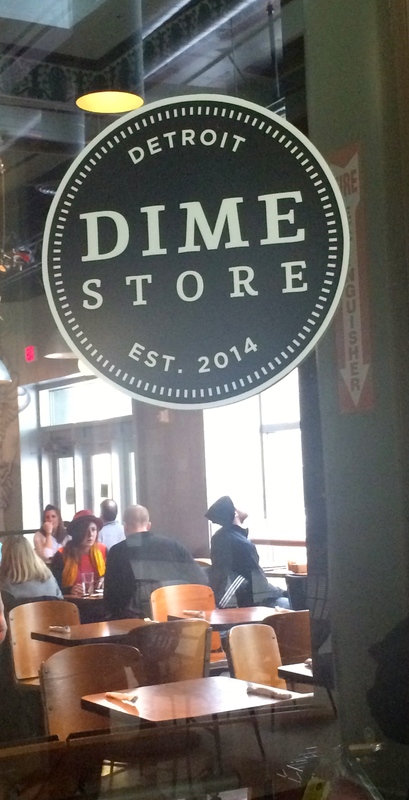 Check out Dimestore this weekend, or make it your new Happy Hour destination on Tuesday through Friday from 3 – 6 p.m. Hours: Mon. 8 a.m. – 3 p.m., Tues. – Fri. 8 a.m. – 10 p.m., Sat. – Sun. 10 a.m. – 3 p.m. Phone: (313) 962-9106 *No reservations, but yes on take-out! Take a peek at their website here to see their menu and meet the Dimestore team.